My Blog by Mail 2 parcel arrived yesterday from Karen in the Phillippines. Karen is from the Pangasinan province and very kindly put together a package of local foods. I'm pleased to say everything made it through NZ Customs. Each item was individually wrapped and now I regret not wrapping the gifts I sent to Eileen, the recipient of my parcel. It was such fun unwrapping each little present. After I had unwrapped all the little packages I proceeded to taste them one by one. Except the Tapuy, which is a rice wine, as it was a little too early in the day. Karen even included table mats and a table runner made from the woven textiles of the Ilocos provinces. See the Angel cookies - and that is two of them on a plate for our morning tea. They are made by the nuns of the Good Shepherd Convent in Baguio City and contain pieces of the Catholic communion host. The Pastillas de Leche are served during fiestas and parties and are very brightly wrapped. Have you ever dipped a teaspoon into a can of condensed milk? This is what the pastillas taste of. I quickly put them in the cupboard so I didn't eat them all in one sitting. My favourite taste though was the Mango Tartlets. These are made from the local mango, a sweet kalabaw. The outer coating is a very light crisp pastry and inside is a chewy mango paste. This little pastry is heaven and I confess I ate three of them right there and then. And another couple later in the day. Then I put them up high in the cupboard so I wouldn't be tempted to eat any more. The last picture is a half eaten one as I wanted you to see the inside. Click on the thumbnails to enlarge the pictures. Thank you Karen for the thought you put into the package. I love it. Big cyberhugs to you. Don't forget to check out Samantha's blog for the round up next month. Look what was at my door when I came back from my morning walk. Come back tomorrow to see what goodies I received from my blog by mail buddy. Thank you Karen . It's Slashfood Pizza Monday. This is my slightly overdone "What's in the Fridge Sunday Night Supper". No time to make proper pizza dough so the next next thing for pizza base is Naan Bread. Cover with the last of the mozzarella cheese, sprinkle over a few semi sun dried tomatoes (the ones that come packed in oil), cubed salami and the leftover baked shallots. Bake in oven until ready. For a crisp base - bake on fan grill. And for soft base - just use the grill element only. Thanks to Anthony I've been tagged a second time for the meme with two tails. This time I'll allow my foodie side to dominate and tell you about the best meal we had with wine in the past 30 days. Goulash di Manzo with Polenta and we drank a Masi Amarone 1995. I had intended to make Osso Bucco but it all seemed to much work for a busy weekend. However the goulash and the Amarone went well together. The wine was robust enough to cope with the heat of the goulash and also went well with the blue cheese that followed. The goulash was made the day before, refrigerated overnight and the next day simmered on low 1 hour before being served. The polenta method I use originates with Carlo Middione, was published in The Splendid Table by Lynne Rossetto Kasper and then in The Cook's Companion by Stephanie Alexander. Fill large saucepan with boiling water. Place 3 litre basin over pan. Pour 2 litres boiling water into basin and add salt. Add polenta and whisk for about 5 minutes. Cook for 1 1/2 hours stirring every 20 minutes. Today I'll tag Mona at MonasApple for the best meal she had with wine and 10x5 at Screwcaps for the best wine he has drunk with a meal in the past 30 days. Follow the meme at Basic Juice . This is a blue cheese made in New Zealand by Kapiti . It is a triple cream blue cheese called Kikorangi Blue and we eat it often. I'm serving it to friends at dinner this evening. A New Zealand restaurant isn't complete without Kapiti Kikorangi Blue on the cheeseboard. France has the famous Roquefort blue cheese. The French consume 1.45 million tonnes of blue cheese annually. The blue cheese made in France is manufactured with raw milk. That is unpasteurised milk that could contain listeria monocytogenes. This little bug could be a danger to pregnant women, newborns, the elderly or people who are immune compromised. You would know if you were one of these people wouldn't you? You would eat the cheese at your own risk. Australians will soon be enjoying the French Roquefort cheese. Authorities predict Australians will enjoy 20 - 30 tonnes of blue cheese per annum imported from France. Not New Zealanders though. No, we will be protected from this French cheese by the FSANZ . Who are the FSANZ? They are the trans Tasman group - Food Standards of Australia and New Zealand. This is their mission statement: To protect, in collaboration with others, the health and safety of people in Australia and New Zealand through the maintenance of a safe food supply. It is the FSANZ who have given permission to import the French cheese into Australia. Of course New Zealanders could always fly to Australia when they fancy a piece of Roquefort. The word pinwheel dates back to 1696 where it was used to describe a wheel in the striking train of a clock in which pins are fixed to lift the hammer. Two hundred years later it became a word associated with fireworks. Now it is better known as a type of rolled scone. I think pinwheel scones possibly started out as a quick and easy version of coffee scrolls where a yeast dough is rolled flat, sprinkled with sugar and cinnamon, rolled, sliced and baked. Using a basic scone dough any number of savoury or sweet flavours can be added to make a variety of pinwheel scones. I came up with this recipe in response to an enquiry I had received. Cover with cream cheese, diced capsicum and crumbled feta cheese. Roll up mixture like a swiss roll. Place onto baking paper on oven tray. Bake for 15 minutes until cooked. Monkey Gland at Jam Faced tagged me for this easy meme. The instructions are to take the 5th sentence from your 23rd post and ponder its meaning. There was no fifth sentence in my 23rd post. It was a very short post to say I was going on holiday. The fourth sentence was - See you in a week. I can't see any deep and hidden meaning there . 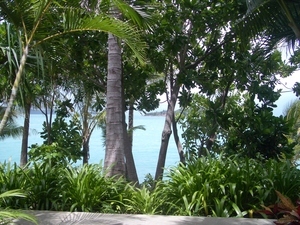 I'd just completed my 8 months of chemo and went for a much anticipated week's holiday on Lindeman Island in the Whitsundays. It was early days of my blogging and I doubt anyone apart from my family and friends actually read it. Cat lover Clare over at Eat Stuff has tagged me for the Meme with two tails - The Best in the Last 30. This latest meme began life with Beau at Basic Juice . Follow the meme here . It is a two part meme and I get to tell you about the best wine I've had in the past 30 days. Catherine at Food Musings will be sharing the best meal matching wine she has enjoyed in the past 30 days. I don't even need to think about this. Actually I do. As it is exactly 30 days since we drank our one and only bottle of Penfolds Grange 1990. That obviously was the best, but I'm going to exclude it for this meme as it is such a rare occurence. I'm selecting the first New Zealand Pinot Noir I've really enjoyed. My first glass was when a friend brought it along to this party. I loved it so much I went out and bought some for this event. With a few contacts in the industry I rarely pay retail for my wine. This is the one wine I won't think twice about paying the retail price. Olssens Jackson Barry Pinot Noir 2003. And now I'm tagging Caroline, the lovely Irish lady at Bibliocook for the foodie tail, and for the wino tail - Ben at Pinot Island who knows all about wine in Tasmania. Check out Beaus post on the difference between the two tales tails. This came into my mailbox via my ISP newsletter. Click on the word more below, then click on the picture. Ryoko discovered this hole in the wall Korean Pancake shop in Lorne Street Auckland, opposite Pathfinders Bookshop. Sweet pancakes are a $1, and even at $1.50 the savoury pancakes are great value. It is no frills with pancakes served in a brown paper bag. The seating consists of 1 table and two stools. The customers tend to be Asian students from the nearby language schools and are happy to stand around chatting amongst themselves. The funniest moment was when we were asked by the Korean pancake maker's helper "where are you from?" The hongi carved from butter at the New Zealand Hospitality Show. Delicious Days Banana Nutella Muffin recipe was the base for these cupcakes. I knew Jenny would be sharing them with her workmates at the office so I wanted something slightly healthy and just a little decadent. They were baked before breakfast, iced after breakfast and delivered in time for morning tea. I used a cocoa flavoured butter frosting added some , candy sprinkles and drizzled melted white chocolate over the stacked cupcakes. Samantha is hosting this round of Blog by Mail. Today I posted off my parcel to *****n in England Ame Au Japa - no I'm not revealing where my parcel has gone. I will tell you it contains some lemon biscotti (that travels well) and I meant to include the recipe and forgot. So here it is. Serve with tea for dunking. Beautiful blood oranges on display at the recent New Zealand Hospitality Show. Unfortunately they are rarely seen in the supermarket or fruit and veggie shops. Wine Blogging Wednesday round up is out. Read about it over at Chocolate and Zucchini. Thanks to Clotilde for hosting this month. Kelly over at The Occasional Epicure has tagged me for the Childhood Memories meme. This tag has passed down through the hands of blogger royalty. Pascale tagged Clotilde who tagged Adam who tagged Augustus Gloop who tagged Kelly who tagged me. It is such an honour to follow these bloggers. I grew up on a farm between Augusta and Margaret River in Western Australia. Like many people from my generation we were a large family with little money. Which I guess was a good thing as we didn't get to indulge in lots of sugary drinks and sweets. These are the five foods I miss from my childhood. My maternal grandparents lived 50 miles away at Busselton, one of the most beautiful places in the world. They lived on the Busselton beach before there was a road between the houses and the beach. We would walk outside the back door and over the sand dune and onto the beach. Most Sundays we would visit my grandparents and when it became dark my grandfather would take us crabbing. It was always a family expedition with Mum's brother and my cousins joining us. My grandfather would walk along the waters edge with a scoop on a long pole which was called the crabbing net. Behind him were all the grandchildren, the little ones carrying torches to spot the crabs with and the bigger kids carrying buckets of sea water. My grandfather would quickly scoop up the crab before it could escape and drop it into the bucket of sea water. The other adults would make a fire on the beach with driftwood. This served two purposes. One to keep us warm and secondly and more importantly, to cook the crabs. The catch would be tipped into a large bucket set over the fire and when the crabs were cooked we would all troop back to my grandparents house where my grandmother would have spread newspaper on the table with salt and pepper and lemons cut into quarters. The crabs would be dumped on the middle of the table and we would all sit at the table eat fresh crab until we could eat no more. This is a fresh water crayfish native to the rivers of South Western Australia. It is now farmed commercially in the region. Again it is my grandfather responsible for this food memory. Every year I would spend a couple of weeks holiday with my grandparents. Totally by myself - no brothers or cousins to distract their attention away from me! Sometimes my grandfather would hitch up his caravan, put his little rowboat on top of the car and we would drive to his secret spot by the river where we would camp overnight. When we arrived he would put the boat into the water and we would row out into the middle of the river where he would drop the marron nets. Next morning we would row back out to bring up the nets and our booty of marron. Living on a farm we didn't always have access to quality fruit and vegetables so my mother had quite a large garden area with various vegetables planted in nice straight rows. The row of corn screened the entire garden from the house . My brother and I were particularly drawn to the pea vines. These peas were the variety called English peas or shell peas. You shell the pod to remove the peas inside which are then cooked, often with a sprig of mint and served with a knob of butter. Not many peas made it to the table as my brother and I spent many an afternoon, hidden by the row of corn, crouching alongside those vines searching for the pod that was almost ready for picking. It was important to pick them just before they were ready for the table and before my mother had a chance to pick them for dinner. We had quite a little production line going. Pick the pod, split it open, run your finger down the inside to release the peas and quickly eat the tender sweet little morsels, then hide the pod in the corn patch before my mother came into the garden. Take a slice of fresh white bread (delivered to the front gate daily by the baker), slather it with butter and top with mashed potato. This made my mother furious when I did this at the dinner table because she said it was bad manners. She denies it to this day but many times she would slap it out of my hands as I went to take a bite. My paternal grandfather was also a farmer. When he retired off the farm and went to live in the suburbs he had quite a large garden area where he grew grapes, rock melon and watermelon. He loved to come and stay at our farm and relive his own farming days. When his visit coincided with summer he would arrive with watermelons and liquorice allsorts. I like liquorice allsorts now but at the time I didn't so I always went for the watermelon. His watermelons were the sweetest and pinkest you could grow. We would sit on the front steps eating the watermelon slices, our faces and shirts covered in sticky juice, seeing who could spit the seeds the furtherest. Crabs and marron and peas and watermelon and mashed potato on white bread are all available today. They don't taste the same. It is the people I shared the food with that made the food special. And now I get to tag three people and I chose. When this months Wine Blogging Wednesday host Clotilde set the challenge Like Wine for Chocolate , my plan was to drink outside the square. I would find something other than sparkling or dessert wine to match the very delicious melt in the mouth chocolate cake recipe Clotilde had posted. I must say this is the easiest flour less (well almost) chocolate cake recipe I have baked. Just melt the butter and chocolate, add the eggs, a spoonful of flour, pour into the tin and bake. And it was best made the day before, which suited me as I had a very busy day before planned. The previous weekend I'd been drinking the Olssens Jackson Barry Pinot Noir '03 and I'd done a little taste test with a Baci chocolate. Maybe this would be my "outside the square" wine. Also included in my tasting were bubbles and a late harvest semillon. Sunday afternoon and my invited "to offer their opinion" guests arrived. My friend the French Horn player had brought along a Nevis Bluff Pinot Gris '02 to add to the table. The wines were poured into glasses and everyone was instructed to taste a mouthful of wine, eat a little cake then finish with another mouthful of wine. I wanted them to notice the changes in the wine before and after the cake and then decide their preference. We started with sparkling, then the pinot gris, next the pinot noir and finished with the late harvest semillon. Everyones preferences were noted one to four and the one with the most votes would be the winner. The French horn player wanted more instructions as he felt he might have a different preference if it was lunch or dinner. His final choice was for the pinot gris at any time of the day. I suspect all that horn blowing has damaged his taste buds! His wife thinks he chose it because he has shares in the company. As much as I desperately wanted my Pinot Noir to be the winner of the chocolate match it only came in second. It was a great match with milk chocolate but today we were eating dark chocolate. It was voted best wine of the day though. It is a stunning wine and here is a link to the distributors page. I expected the Sileni Estate Selection Late Harvest Semillon '03 to be a more suitable match than it was. Clearview Sea Red Dessert Wine 2004, a cabernet franc/merlot blend from Hawkes Bay, would have been a better choice. There are shiraz or syrah wines that will go with chocolate and I'm sure other bloggers will go down this path. There isn't a shiraz in my cellar I was confident would match this chocolate cake. I thought about opening my last bottle of Masi Amarone '95 but that is marked for a special meal coming up soon. Finally we all voted the sparkling as the best match. Not expensive sparkling either. The Italian Riccadonna Asti. The slight sweetness of the wine allows the chocolate flavours to shine without overpowering them. I like this description of Riccadonna Asti from the 2003 edition of Drink Drank Drunk by Ben Canaider and Greg Duncan Powell - Think of a bowl of strawberries that have been dressed with a sprinkle of caster sugar, a dash of tokay, and a few drops of balsamic vinegar. Doesn't that sound like something you'd like to drink with chocolate cake? I first saw these at Esurientes who saw them at Baking Sheet who got them from Donna . Joey over at 80 Breakfasts also made them and hers look fantastic. She has managed to get perfect swirls of Nutella. I skipped the "soften the Nutella" bit and just placed a spoonful on top of the cake mixture. It was impossible to swirl and the result is a flat cupcake with a blob of Nutella on the top. Apart from the swirl they were unbelievably easy and quick to make. Eat them fresh from the oven while they are still warm. I'll make them again and this time I'll soften the Nutella first. Blog Day 2005 - another event I didn't manage to participate in . If I had got my act together in time I would have told you to visit this blog - Weblogsky . 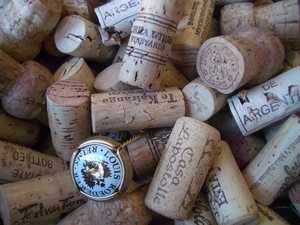 Benjamin over at Wine by Benito put out a challenge for bloggers to gather their corks and sort them out. I resisted the urge to sort them into countries. This tally doesn't include all the screw caps or the wine we drank in restaurants , on holidays overseas and at friends. Add in another 200 or so for the corks used for making cook boards. I once made a cork board for a friend with corks from the bottles we had shared over 12 months. This collection represents 5 years of wine drinking and a quick play with the calculator tells me we spend about $100 a week on wine. Another Beautiful Day in New Zealand - Yeah Right! Somedays I have these bright ideas. Like - lets have breakfast at the beach tomorrow morning. It seemed like a good idea at the time. This morning was a post chemo blood test day, we would pick up some pastries on our way to the lab, do the test, continue on and get some take away coffees, find a spot in the park by the beach where we could enjoy a leisurely breakfast in the sun before our daily Takapuna Beach walk. Every morning this week we have walked under blue skies, the sun on our faces as we walked along the beach and warming our backs as we walked home. I swear when I opened the curtains the morning I saw blue sky. By the time we were dressed and out the front door we could not see 2 metres in front of us. I figured by the time we picked up supplies, waited around at the lab because it's always busy in the morning and finally got to the beach it would have cleared. But no, not today. This was our beach this morning. No blue skies and no warm sun. Rather nice listening to the waves though.